It’s been a while since I’ve blogged, but could there be a better day to make a comeback than on the Queen’s Diamond Jubilee? The fashion press and bloggers were undoubtedly waiting with bated breath to see what the stunning Kate Middleton would adorn her ever so tiny frame in. Once again she’s done the nation and the McQueen fashion house proud, shimmering in a striking brilliant red McQueen dress along the Thames against the dull, wet and rainy backdrop, that has unfortunately made the setting for the day. 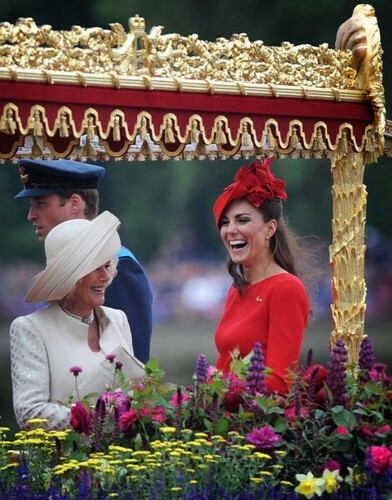 Kate Middleton complimented her red dress with a red Sylvia Fletcher flower embellished hat worn to the right from James Lock and Co. This particular McQueen dress is taken from the autumn winter 2011 McQueen collection and has previously been donned by the likes of Kim Kardashian and Tulisa. Admittedly, these are three very different bodies playing three very different roles in society, however the £1,195 knee length red dress looks very royal on the Duchess of Cambridge, whilst quietly nodding…or, more aptly, gently waving towards one of fashion’s key trends with its pleated skirt.